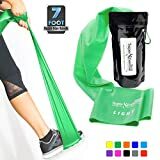 Super Exercise Band Light Green 7 ft. Long Latex Free Resistance Bands Door Anchor Set, Carry Pouch, E-Book. for Home Gym, Strength Training, Physical Therapy, Yoga, Pilates, and Chair Workouts. 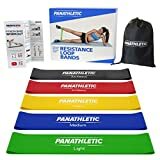 SPECIAL DISCOUNTS and GUARANTEE --- Choose your discount on 7ft long resistance bands, mini-loop bands and 3 pack sets when you buy 1 or more single exercise straps in any combination of colors. See Special Offers and Product Promotions down below for full details. All products are covered by our unconditional guarantee, so buy with confidence from the best USA based brand. ULTIMATE CORE ENGAGEMENT - Synergee Core Sliders are perfect for fun and challenging full-body workouts. The Sliders introduce a balance and stability challenge to every movement, which forces you to engage your core muscles and results in your abdominals becoming stronger (and better-looking) than ever! COMPACT & CONVENIENT - These sliders are convenient for so many reasons: they are small, light, and compact, which makes it easy to store them when not in use. Plus, every move is low-impact, reducing your risk of energy. These Sliders very portable for people who are constantly on the go or for athletes who like to workout when they travel! Fits easily into a backpack, purse, and carry-on. 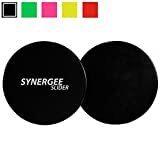 DUAL SIDED FOR MULTIPLE SURFACES - You'll be able to bring your Sliders everywhere you go and with the dual sides you can slide on multiple surfaces! Nothing can stop you from getting your core workout in! The Foam side works best on hard, smooth surfaces like hardwood floors. The Plastic side works best on softer surfaces, like carpet or turf. WHAT'S IN THE PACKAGE - This package includes 2 Core Sliders in Black. Each slider is 7 inches in diameter and is accompanied by a color-printed exercise manual describing 5 different exercises you can do with them. LIGHT | LOWER RESISTANCE STRETCH BAND SELECTED - 0.35mm thick. 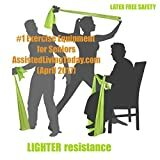 These low resistance green exercise bands are designed for elderly, seniors, retirees, children. An ideal pregnancy exercise band. Also great for kids, rehab, Physical Therapy (PT) and newbies. LONGER BAND - Ideal for seated exercises - can use chair structure. Tie to make exercise loop. LATEX FREE SAFETY. Non-latex (TPE). Same elastic stretch. GREAT PACKAGING for storage. A great fitness gift idea. 15% OFF EVERYTHING - buy 2 or more (any combination of band tensions). Automatic at check-out.